Arabic is one of the less commonly studied languages at Ohio State. What inspired you to study it, along with political science? I was a member of my high school’s Model United Nations team and was often on committees where I had to research various issues in the Middle East. After a couple of conferences, I developed a passion for working toward creating solutions for these conflicts. I knew I wanted to study political science when I was accepted into Ohio State, so I met with Professor Herrmann, the chair of the department, and he suggested studying the language of the region. After my first Arabic course, I fell in love with the language and the culture, and I decided to add it as a second major. 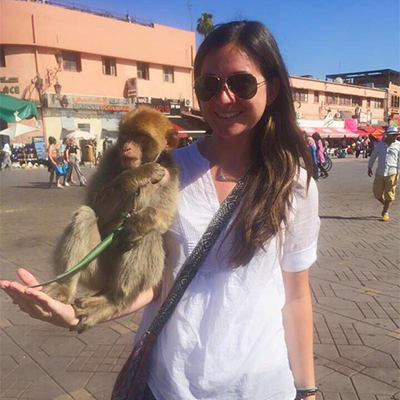 You studied abroad in Morocco through Ohio State’s Global May program. How does life in Morocco compare to life in the United States? Life in an Arab nation is much different than in the United States. I lived with a host family, so I was able to experience all of the traditional customs of a Moroccan family — my favorite being couscous Fridays! I was most surprised about the extent to which kindness and giving is engrained into the culture. My host family, the families of other Ohio State students on the trip, and most of the people I met through trips and classes went above and beyond to ensure that the students had an amazing trip. I am fortunate to still be in contact with my host family and Moroccan friends. What are some preconceived notions that people have about the Arabic language and culture? What would you tell people who do not study Arabic or know much about it? Many of the preconceived notions about Arabic and the Arab world are derived from unwarranted fear. Before I started studying Arabic, I had no idea how beautiful and fun the language and culture is. My advice to anyone who does not know much about the Arab world is to keep an open mind, because you will be amazed with the food, music and kindness of the Arab population. What do you hope to accomplish after graduation? I have recently been accepted into law school to study international law with a focus on human rights. After I graduate from law school, I hope to be able to further my current work with refugees in the United States and abroad. What is a favorite word or phrase of yours in Arabic? What does it mean, and why is it significant to you?